The Taos Connection | Blog about Padre Antonio José Martínez, Cura de Taos. When he died, his peers in the USA Territorial Assembly for NM wrote on his epitaph, "La Honra de Su País" – The Honor of His Homeland. The last decade of his life–in the years following the American occupation– was clouded by controversy with his new bishop. Fray Angelioc Chavez in My Penitente Land called him "New Mexico's greatest son." This blog is dedicated to the life and legacy of this priest, educator, printer-publisher, lawyer-politician, rancher, patriot. As a young priest, Padre Martinez objected to tithing that he perceived as a severe burden on the poor. Since 1829–only three years after he arrived back in Taos as the priest in charge–he publicly voiced his opinion. As a civil legislator for the Departamento de Nuevo Mexico in the still new Republic of Mexico, independent from Spain since 1821, Padre Martinez advocated abolishing the system of tithing. In a union of church and state–for centuries, the norm in Europe and by extension in early Hispanic America–the government was in charge of collecting tithes as income to pay government expenses as well as church expenses including the salary of clergy. As early as 1829, without objection from his Bishop José Laureano Zubiría of the Diocese of Durango, Padre Martínez successfully advocated for a change in the policy. Durango Diocese extended to Taos, to the whole northern frontier of the Kingdom of Spain that included all of New Mexico and beyond. Tithes were fully abolished by the mid 1830s, but by 1853, Bishop Jean Baptiste Lamy, the first Bishop of New Mexico after it became part of the United States,revived the policy of tithing. 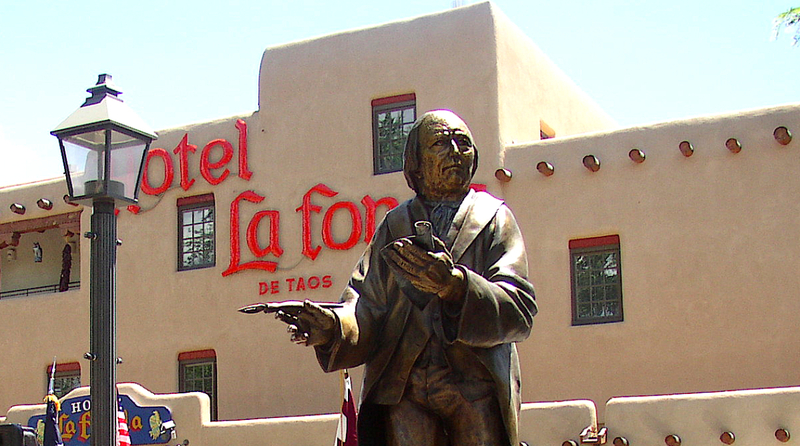 Wtit the the American occupation of Santa Fe, New Mexico became a Territory of the United States in 1846. It new ecclesiastical jurisdiction under the diocese of St. Louis began in July 1851 when the new Vicar Apostolic Bishop Lamy arrived at Santa Fe from Ohio where he had been a missionary priest. Padre Martinez joined the other native New Mexican clergy, Spanish Franciscans and laypeople in welcoming Lamy destined to soon become the first bishop of Santa Fe. Padre Martinez made overtures to ingratiate himself with the new prelate. For his part, Bishop Lamy initially sought advice from the Padre known for expertise in canon law, and even borrowed money from Padre Martínez who had come from a relatively wealthy family. In his attempt to finance the operation of the still-new diocese, Bishop Lamy promulgated a new policy about tithing in a Pastoral Letter of the early 1850s . He imposed the penalty of denying Christian burial to families that did not comply with contributing tithes . After serving in his beloved Taos for three decades as a busy parish priest, politician, printer and publisher, Padre Martinez was getting elderly, tired and sickly. He was thinking of possible retirement, and shared his musings with the Bishop. As a young man in Durango about to be ordained a priest, Martínez suffered from a breathing condition (asthma?) that impeded his health, but he recovered upon returning to Taos. As a mature man in later years, he suffered other maladies. In a letter written at the beginning of January 1856 , Padre Martinez advised Bishop Lamy of his ill health that included bladder infection and severe rheumatism that made walking difficult. Martínez requested help, preferably a native New Mexican priest as an assistant, and specifically asked for Don Ramón Medina whom he had trained in his preparatory seminary. Padre Martinez suggested that Padre Medina could ultimately replace him as pastor. Bishop Lamy chose to interpret the letter as a “resignation,” and accepted it as such. The Bishop appointed a new priest to succeed Padre Martínez as pastor of Taos, and the change became effective within three months by May 1856. Bishop Lamy had met Don Dámaso Taladrid, a Basque priest and ex-military chaplain, during one of his trips to Rome, and invited him to the diocese of Santa Fe, and appointed him to succeed Padre Martínez in Taos. Father Taladrid had little regard for the health situation of Padre Martinez or for his thirty years at the parish of Our Lady of Guadalupe. Furthermore, Father Taladrid made it difficult for Padre Martinez to celebrate Mass at the parish, and even refused him permission to preside at the wedding of a favorite niece that was about to take place. The two priests clashed. Father Taladrid newly in charge of Guadalupe Parish in Taos was being disrespectful to Padre Martínez as pastor emeritus. Taladrid made derogatory comments against Martínez, and made it difficult for Martínez to say Mass in the parish church. To avoid these difficulties Padre Martínez since the summer of 1856 had been building a private oratory with its walled cemetery on his property and at his own expense. By the fall,in a letter to Bishop Lamy –dated October 1 — PadreMartínez complained about Father Taladrid’s untoward behavior. At the same time,Martínez formally informed the Bishop of his new private chapel. However since June, Father Taladrid had already reported to Bishop Lamy that Martínez was building a private oratory on his own property. During this time, the public controversy over Bishop Lamy’s Pastoral Letter that mandated tithes was heating up. When Bishop Lamy re-introduced the policy of tithing in order to meet new expenses, he imposed exclusion from the rites of Christian burial for the deceased of those families who could not comply. Padre Martínez, through his public writings in the newspaper La Gaceta of Santa Fe, strenuously and publicly objected to this change in policy. For his “scandalous writings,” Bishop Lamy suspended Padre Martinez in October 1856. Suspensio a divinis is the ecclesiastical censure by which a cleric, for a breach of discipline or for moral turupitude, is prohibited from exercising “the divine things” of priestly ministry. The bishop deprived the suspended priest from his faculties (license) to celebrate Mass, preach, or hear Confessions with Absolution except in danger of death. In such cases, through the mercy of God, “ecclesia supplet,” the church supplies faculties and jurisdiction for a suspended or excommunicated priest to administer to a dying person the last rites of penance-absolution and anointing with the Holy Oils, and to give Holy Communion, called Viaticum when a Catholic is in either danger of death or already at the point of death . The ultimate ecclesiastical censure of excommunication took place two years later shortly after Easter in the spring 1858. It is worth noting that church censures imposed on Padre Martinez were not for moral failings, but specifically for his “scandalous writings” as noted in church records of the Taos parish. It remains my hope that such penalties be posthumously overturned as was done for Galileo, Joan of Arc, and John Hus. The 245 paragraphs within six chapters across 181 pages of the new encyclical of Pope Francis on ecology will likely be one of the most widely read documents after the bible. Hyperbole? I don’t think so, given the worldwide interest in the topic and contemporary media channels. On the Care of Our Common Home ends with a suggestion of two prayers. The first is “A prayer for our earth” echoes themes of St. Francis’ Canticle of Creatures that serves as the title in Italian of the encyclical, Laudato Si, mi’ Signore. http://www.appleseeds.org/canticle.htm The second prayer is for believing Christians. The style of the letter is eminently readable, unlike the usual genre of papal statements, and is meant for all inhabitants of the earth—not just Catholics or religious folk. Pope Francis intends his message to be joyful, but admits it is also troubling. Even though Francis exhorts, “Let us sing as we go,” he is not a Pollyanna. The encyclical addresses concrete problems about the care of the earth, and it also makes some difficult points. Read it for yourself. …the Lord of life, who loves us so much, is always present. He does not abandon us, he does not leave us alone, for he has united himself definitively to our earth, and his love constantly impels us to find new ways forward. Praise be to him! Although released just before the beginning of summer, the work is dated on the feast of Pentecost—May 24, 2015. May the illuminating breath of Yahweh inspire all human beings to receive it well and put it into practice for the world’s health and wellbeing. I found it intellectually stimulating, scientifically grounded, mystical, poetic, and spiritual. That’s quite a banquet! Above all, it is fraternal–simply signed “Francis”. If you wish an autographed hard copy, I request a donation of at least $15 that would also cover postage. Let me know by email <romerojuanrvi@aol.com> to whom the book should be dedicated, and where it is to be sent. The work ha stood the test of time. MACC (Mexican American Cultural Center – now called MA College) first published it in 1975. The Taos Connection published a second edition in 2006 on the occasion of the unveiling of the larger than life-sized Padre Martinez bronze Memorial in the Taos Plaza (LA HONRA DE SU PAIS/The Honor of His Homeland). From one “S.F.” to another “S.F.”: On June 4, after having served as Bishop of Utah (Salt Lake Diocese) for eight years, San Francisco-born John C. Wester will become the new Archbishop of Santa Fe. “When Papal Nuncio Pietro Sambi called me from DC to inform me of the appointment, I was stunned, startled, and humbled,” said Bishop-Elect Wester to an American correspondent on a Vatican Radio interview in late April. Utah and New Mexico for centuries have been linked, and that connection will deepen when the new Archbishop will be installed. The Ute peoples, for whom Utah is named, have lived in the area for over a thousand years. The Spanish visited some five centuries ago, and New Mexicans migrated to and settled in Utah for the half-millennium up to the present day, including some of my relatives who worked there seasonally as sheepherders. In the sixteenth century, the Viceroy of New Spain claimed the great swath of land, including what is now the state of Utah, as part of the Kingdom of Spain’s La Nueva (Custodia de) Mexico. With Mexican independence from Spain in 1821, Utah as part of New Mexico was incorporated into the Federal Republic of Mexico, and remained so for a quarter of a century. The Mormon people came into Mexico’s Utah in 1847, and within three years—without their moving a step– they came to belong to a territory of the United States of America. Forty-six years later, in 1896, and sixteen years before New Mexico, Utah became the forty-fifth state of the Union. With the appointment of John Charles Wester as the twelfth Archbishop of Santa Fe– succeeding retiring Archbishop James J. Sheehan–the connection between New Mexico and Utah becomes deeper and stronger. The episcopal motto of Archbishop Wester is “Abide in Christ.” Upon his arrival in NM, he will encounter, especially in the northern regions of the Santa Fe Archdiocese, a series of small independently owned adobe buildings called moradas. The Penitent Brotherhood of Nuestro Padre Jesús Nazareno uses them for their religious rites especially during Lent and Holy Week. Some believe the Spanish word morada refers to the color purple in deference to liturgical vestments worn during Lent. Not so. Its true meaning is ABODE–from the Latin verb morari: TO DWELL. In these final weeks of Eastertide, the daily liturgical readings from the Gospel of St. John are replete with references to the theme of “…abide in me…” (e.g., Jn. 15:9-11). To “abide in Christ” is the invitation and challenge of anyone who calls her/himself Christian/Catholic. Archbishop Wester is a good fit for Santa Fe. He knows Spanish, and relates well with a variety of ethnic and religious groups such as Filipinos and Vietnamese. His multicultural and interreligious talents include serving on a U.S. Bishops’ Committee on Ch’an/ZEN-Catholic Dialogue, as well as having chaired the Bishop’s Committee on Immigration from 2006 to 2007, and currently chairs the Committee on Communication. Bishop Wester’s experience has been broad, and his credentials are excellent. A fourth generation Californian, he was born in San Francisco in 1950. He went to high school seminary, and was ordained for the Archdiocese in the bicentennial year of 1976. First assigned to parish work and then to the work of Catholic formation: campus ministry, high school teacher and president, then Assistant Superintendent of Archdiocesan High Schools. In 1988, then Archbishop of San Francisco and President of the U.S. Bishops’ Conference, Archbishop John Quinn appointed Msgr. Wester to be his priest-secretary. Archbishop Quinn named him in 1993 to his first pastorate of a parish. Four years later, the succeeding Archbishop of San Francisco William Levada appointed Msgr. Wester to be the Vicar for Clergy. The following year in 1998, Pope John Paul II named Wester Auxiliary Bishop of San Francisco, and at the same time Archbishop Levada appointed him as Moderator of the Curia and Vicar General. 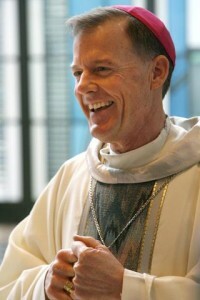 In March 2007. the next Archbishop of San Francisco, George Niederauer (former Bishop of Salt Lake), installed Bishop Wester as Ordinary (Bishop in Charge) of the Diocese of Salt Lake that encompasses all of Utah. This San Francisco native brought to Utah an abundance of human qualities that make him as well a good choice for his new post in New Mexico. Priests of his former diocese of Salt Lake praised him. Msgr. T. Fitzgerald said the Bishop is “…kind, compassionate, most generous…[and] open to every person” Fr. Martin Diaz described him as “a passionate shepherd, truly ecumenical, intelligent, and articulate.” Some lay people described him as relaxed, but with a track record of helping the poor and lifting up those in need. His accomplishments as Bishop of Salt Lake Diocese bode well for his ministry as Archbishop of Santa Fe. He certified sixty-four lay Spanish- speaking ministers last year, and is responsible for the formation of seventeen Spanish speaking permanent deacons who are expected to be ordained within two years. He has addressed the growing number of multi-ethnics within his diocese by bringing in a greater number of multi-cultural clergy. Maria Cruz Gray, Director of Hispanic Ministry in the Diocese, states that Spanish-speaking Catholics populate 95% of diocesan missions! Bishop Wester has responded to the growing number of Hispanics in the Diocese not only with more Spanish or bilingual Masses, but–more importantly–with his “wonderful pastoral outreach and bridge-building between Anglo and Hispanic members of his flock.” His great love for the people is manifested in such things as his support for traditions and a formation program called Instituto Congar (named for progressive French theologian who in the mid-Twentieth Century wrote brilliantly on the role of the laity). Now Pope Francis has called John Charles Werster to serve as the new Archbishop of Santa Fe. Skills yet to be sharpened for coming challenges include relating well with the unique cultural aspects of Native Americans and the proud Spanish heritage of native New Mexicans. In an interview with Vatican Radio, Archbishop-Elect John Wester projected a properly humble attitude for coming into his new Archdiocese. “I recognize their dynamism in the faith, and my first priority will be to LISTEN.” Father Javier Virgen, Vicar for Hispanic Affairs of Salt Lake Diocese, vouched for the new Archbishop’s “incredible capacity to listen,” and lauded his great compassion as well as disposition to always be with the people. I sincerely hope those qualities will incline the new Archbishop of Santa Fe to encourage long-time efforts–since the early episcopate of +Robert Sanchez– to posthumously rehabilitate Padre Antonio José Martínez from ecclesiastical censures that I believe were unjustly imposed in 1856 and 1858. Archbishop-Elect Wester, appointed as new Archbishop of Santa Fe at the brink of 65 years of age, will have a full decade before being obliged to offer his resignation to the Holy Father. May his assignment be a blessed and fruitful time during which our loving Lord will bless his new ministry. We invoke the Holy Spirit to illumine and strengthen him in all of its aspects. We pray that Blessed Mary–through the double invocation of Nuestra Señora de Guadalupe y La Inmaculada Concepción, both so dear to Padre Martínez–be with him “for the whole ride” to serve well the local church of Santa Fe. “So far, I have been on an emotional roller coaster, but will do my best,” he said during his late April interview with Vatican Radio. You may Tweet congratulations to the new Archbishop-Elect of Santa Fe (@BishopWester ) or write to him in care of either his present or future address: Most Rev. John C. Wester – 27 C Street – Salt Lake City, Utah 84103/or at 4000 St Josephs Dr, NW – Albuquerque, NM 87120. Census map of 1830: Territory—together with most of Latin America—that the Viceroy of Spain in the sixteenth century claimed as New Spain. From 1821 until 1846, after Mexico’s independence from Spain, the Federal Republic of Mexico claimed these extensive territories. Through “Manifest Destiny” and by war ending with the 1848 Treaty of Guadalupe Hidalgo, Mexico ceded the large swath of almost half its territory to the USA. The land includes all of Alta California, Nevada, Utah, Arizona, New Mexico, and the great state of Texas. It also includes the western half of Colorado, a piece of southwestern Wyoming, a sliver of southwestern Kansas, and the Panhandle of northwestern Oklahoma.